The Observation Hill – a great mound of earth – rises up from the ground below, offering views of the expanse of unencumbered African landscape all around. To its distant south, stands the even grander Kilimanjaro Mountains. To the north-east, and immediately from the base of the observation mound runs a linear body of water, a popular spot where elephant herds congregate and drink from, and cool themselves from the African heat. On the top of the mound presents a view out to wild Amboseli nature, the only site in this area of wilderness where visitors are allowed to be uncaged from the protection of their viewing safari vehicles to safely roam and hunt with their camera lenses the surrounding ecosystems of feathered birds and leathery hides; or else witnessing the quiet changes of climate on a slowly-shrinking wilderness, and perhaps vanishing species. Time does not sit still while the camera shutters click. 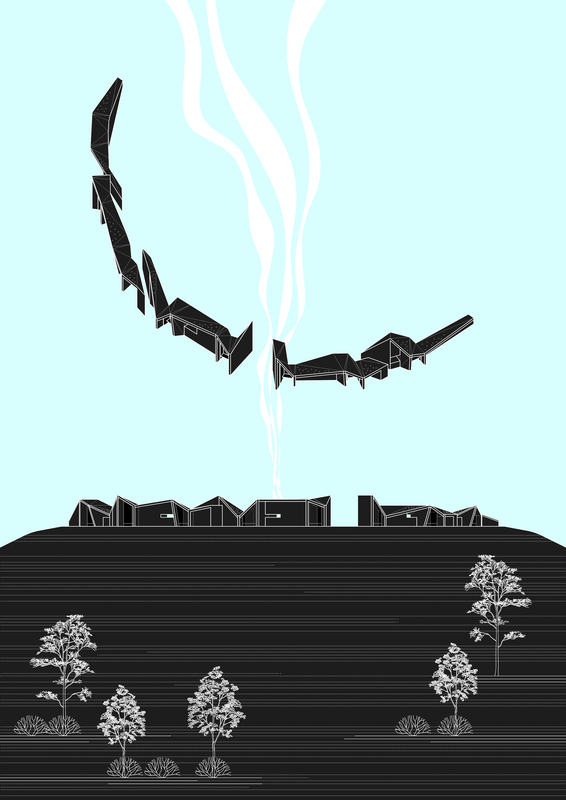 A wall is imagined to arc around and delineate the “safety zone” of visitors and views along the hilltop, set away from uncontrollable and untameable wilderness below. Along this curved wall, and set ten metres apart, one from the other, are isolated seats – benches set within steel frames, pulling each visitor out from their natural herds and placing them in confrontation of bare self, within the wilderness of landscape and open sky. And time. The walls are rammed-earth, or packed-mud, or mud-brick monuments that accumulates in layers and is made permanent by the baking of earth in the sun. But the wall is not built to last. Little by little the earth crumbles, and is eroded away by torrential downpours during the wet seasons of the African landscape. Both human and animal eyes quietly observe a “landform” that is also quietly changing – at times drying fast in resistance to natural entropy, and at other times chipping and dissolving away into ruins. 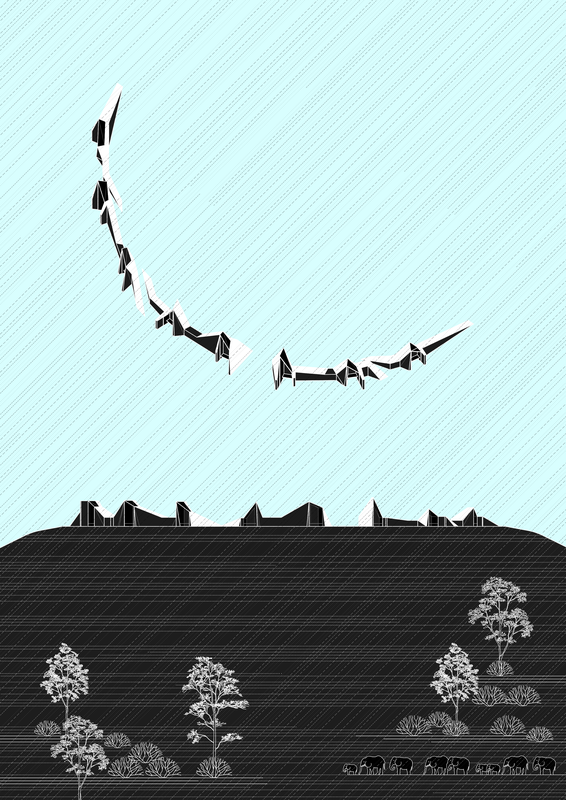 In time, the pavilion disappears – earth returning to earth, leaving behind its skeleton of iron and rust, and fragments. Architecture, here is a precarious monument and a reminder of an equally – if not more precarious wilderness in the natural landscape all around. While the wall vanishes, its sole absence registers as permanent. 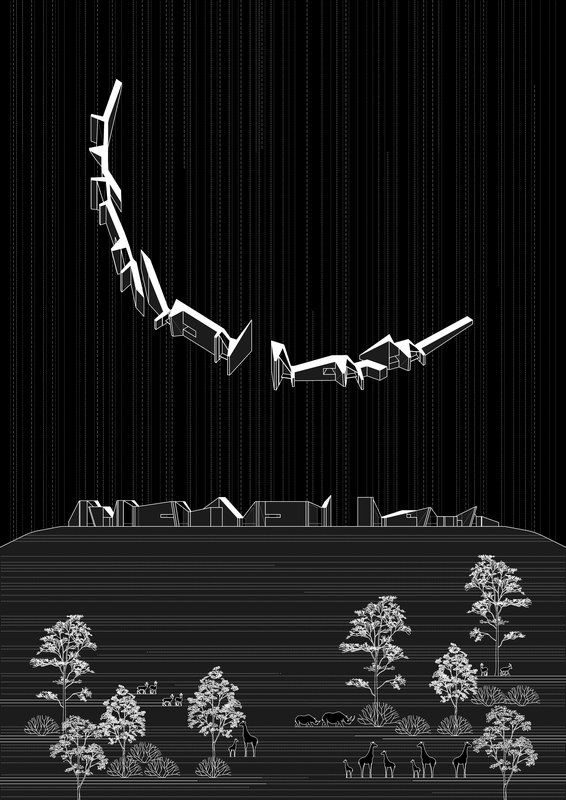 This design exercise was produced as a competition entry for Archasm’s Call for Ideas for a Wilderness Pavilion on Observation Hill, in Amboseli National Park, Kenya. 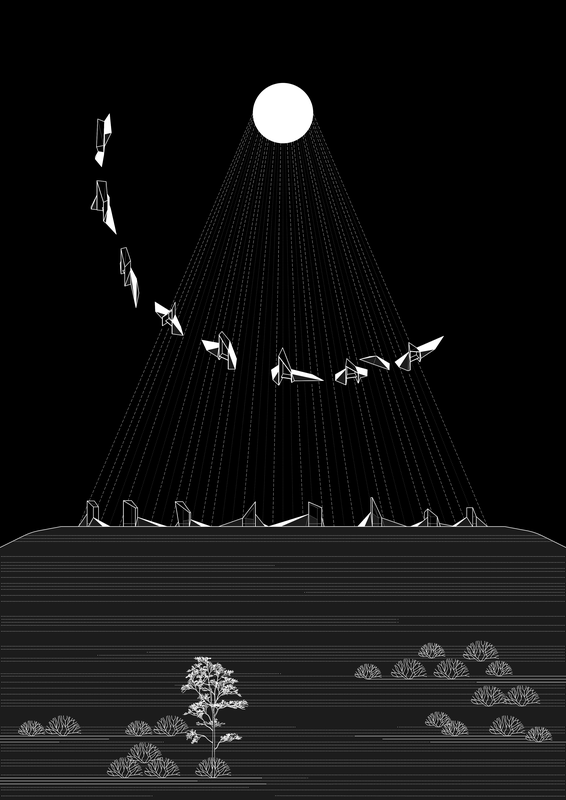 The premise was to “design a free standing pavilion in the heart of Amboseli National park that would allow visitors new ways to view and experience the wilderness and be close to nature”, with the proposal being a “poetic response” in a “very sensitive environment that would become the ‘eyes and ears’ for visitors who want to connect with the natural ecosystem and reflect upon nature in its true spirit”. We came in top 25% out of 200 schemes submitted to the competition. 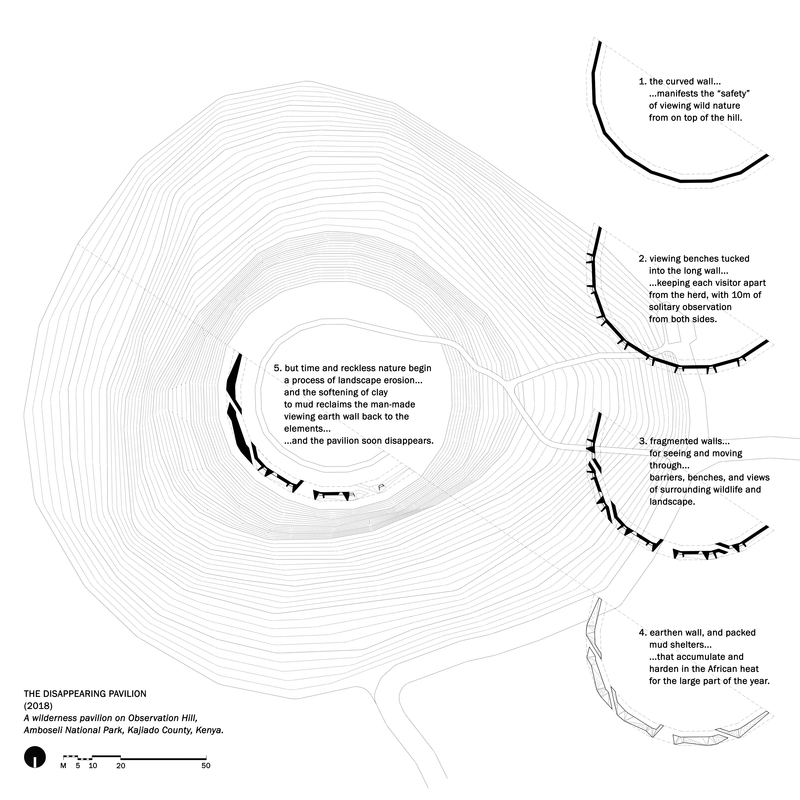 Note: All quotations are referenced from the brief: ‘Archasm Wilderness Pavilion Kenya Competition’, Archasm as published in e-Architect, 22 July 2018, [accessed 19 September 2018]; www.e-architect.co.uk/africa/archasm-wilderness-pavilion-kenya-competition.